what is a healthy snack? 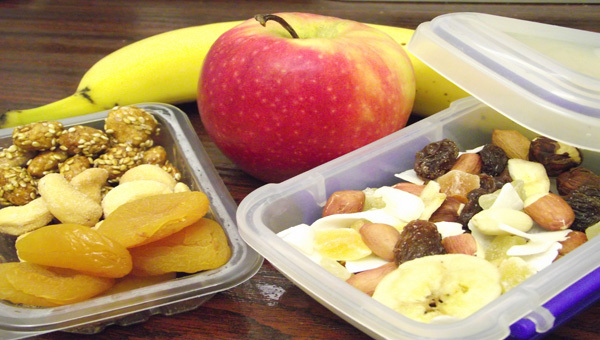 A healthy snack is a mini meal that you can add into your diet in between the main meals of the day. It is important to have these to keep your hunger down. Many small meals throughout the day are better than being hungry and pigging out when you finally do eat. Not to mention, if you keep your body fueled with snacks throughout the day your metabolism will be higher. A snack doesn’t have to be a full meal. It can be as simple as a piece of fruit, some nuts, a protein shake, dried fruit, or whatever is convenient. When I say convenient that doesn’t mean slipping a few quarters into a snack machine and pulling out a bag of hot cheetos. If you are at home you can put a few healthy things together to make a light mini meal. Check out the video below for an example of a healthy snack.